Look at my new toy! 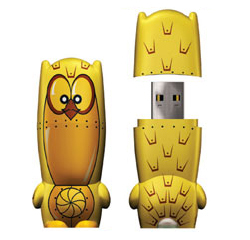 Made by Boston’s own Mimoco, this badass owl holds 8GB and comes with a little blue jacket. After downloading 9GB worth of Mad Men and Metalocalypse, I need some auxiliary storage deeeeeeeeevices! Am totally getting my Dad one of these for Father’s Day. He so lucky! This entry was posted on June 1, 2008 at 12:18 am and is filed under nerding. You can follow any responses to this entry through the RSS 2.0 feed. You can leave a response, or trackback from your own site.